It's GRAND FINALE WEEK! February has been an awesome, crazy month! The final celebration of Customer Appreciation Month is yet another $10 giveaway! And to make it even more fun ~ I am giving away another $10 gift certificate at my Facebook page!! What would you buy with your $10 gift certificate?? Have you seen this brand new product yet? It is a glimpse at what is to come. 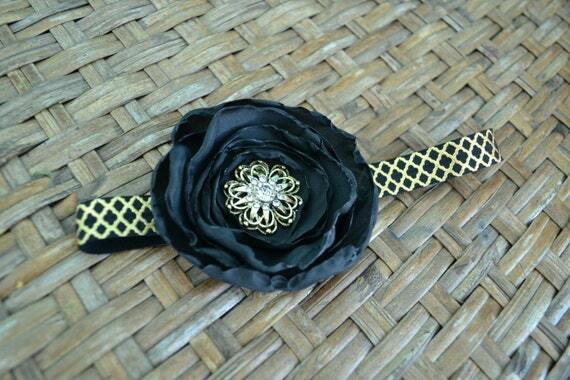 Gold is HOT, and this new Gold foil Elastic is amazingly beautiful! My friends are all having baby girls! I need to buy some super cute gifts! That new headband is so pretty! Thanks for all the giveaways; it's been fun browsing your shop!